Here is a real ‘guest’ of a garden: the Subtropical Asian Garden. Nestling in the valley, it evokes the landscapes of distant yet familiar lands. These plants come from China, Korea, Taiwan and southern Japan, and some from the Indo-Malaysian region. These regions have a summer monsoon cycle. 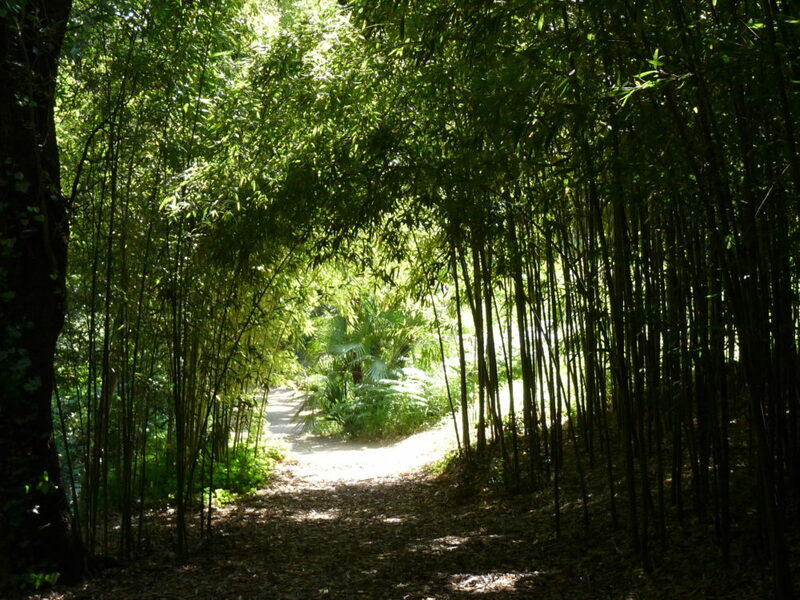 Having grown here for a century, the bamboo grove is the heart of this landscape. 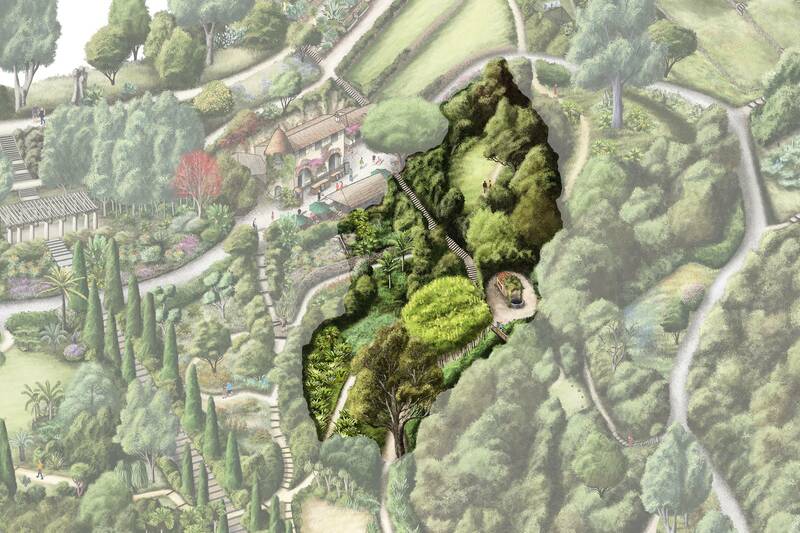 The area around the well creates a haven of freshness with vines, Wisteria sinensis and the Ficus pumila Chinese fig tree climbing up the canopy of holm oaks. An artificial waterfall – operating in a closed circuit from the old tank supplied by the Domaine’s only small spring – improves humidity during the summer. In the shade of the holm oaks grow Nandina, known as celestial bamboo; the ‘rice paper plant’, Tetrapanax ; a carpet of Japanese fringed iris with its fabulous whitish-pink flowers; the Alpinia zerumbet which is similar to ginger; Caryota palm trees with their unusual ‘fishtail’ foliage; and the superb Loropetalum which looks like a cloud of white confetti when in bloom. Past the well, a clearing shelters a Cinnamomum camphorum camphor tree (from which camphor and ravintsara essential oil are extracted by distilling the wood and leaves) and Japanese Musa basjoo banana trees. 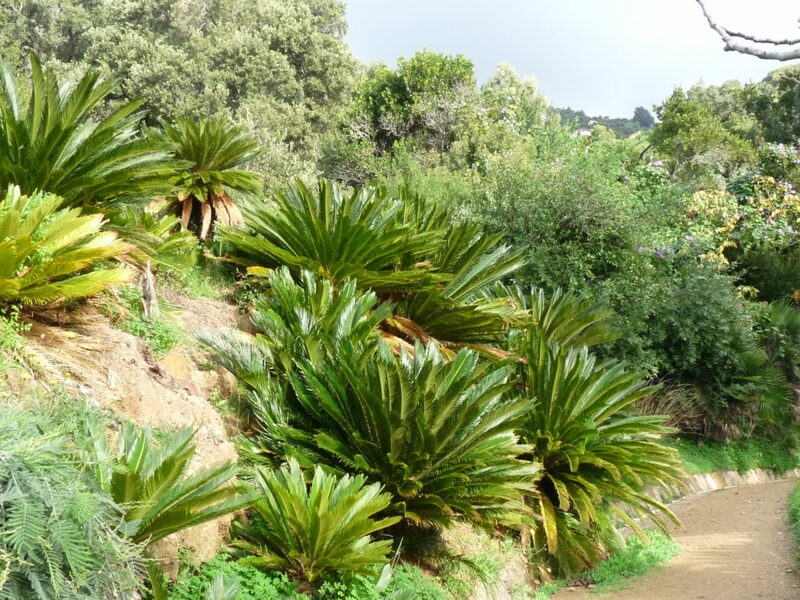 An original Cyca revoluta grove occupies a sunny clearing surrounded by Sasa dwarf bamboo, small Trachycarpus palm trees and large Livistonia fan palms, a Firmiana simplex ‘Chinese parasol’ and Rhaphiolepis umbellata with its delicate flowers. In summer, the scent of lemon spice fills the air, emanating from the Zanthoxylum Sichuan pepper and the spiny Poncirus lemon tree. Two Gingko biloba have been planted in the clearings. This species, unknown in nature, has only come to us through having been grown in the gardens of Buddhist temples for two millennia.